This article first appeared on Still Searching, where Ariella Azoulay will be publishing a series of essays titled "Unlearning Decisive Moments of Photography". In her series of statements, Azoulay seeks to invert common assumptions about the moment of emergence of photography, and locates the origins of photography in the "New World" and in the early phases of the European colonial enterprise.The essays are based on the forthcoming book "Potential History: Unlearning Imperialism", which is out on Verso in Fall 2019. Imagine that the origins of photography go back to 1492. The invention of the New World and the invention of photography are not unrelated. Suggesting that the origins of photography go back to 1492 is an attempt to undermine the imperial temporality that was imposed at that time, enabling people to believe, experience, and describe interconnected things as if they were separate, each defined by newness. To put it another way, for photography to emerge as a new technology in the late 1830s, the centrality of the imperial rights on which photography was predicated had to be ignored, denied, or sublimated, or in any case pushed into the background and not perceived as constitutive of its operation as a technology. Foregrounding these rights requires a simultaneous exercise — unlearning the accepted origins of photography and those of the “new world,” their familiar spatial and temporal connotations, which even today are still closely associated with modernity and “the era of discoveries,” and attending instead to the configuration of imperial violence and its manifestation in rights. By imperial violence I refer to the entire enterprise of destroying the existing worlds of signs, activities, and social fabrics and replacing them with a “new world” of objects, classification, laws, technologies, and meanings. In this so-called “new world,” local populations and resources are perceived as problems or solutions, opportunities or obstacles, and are assigned specific roles, places, and functions. Through these processes, existing sets of rights that were integral to each world and inscribed in its material organization are destroyed to allow imperial rights to be imposed. Among these rights are the right to destroy existing worlds, the right to manufacture a new world in their place, the rights over others whose worlds are destroyed together with the rights they enjoyed in their communities and the right to declare what is new and consequently what is obsolete. The attachment of the meaning “new” to whatever imperialism imposes is constitutive of imperial violence: it turns opposition to its actions, inventions, and the distribution of rights into a conservative, primitive, or hopeless “race against time” — i.e., progress — rather than as a race against imperialism. The murder of five thousand Egyptians who struggled against Napoleon’s invasion of their sacred places and the looting of old treasures, which were to be “salvaged” and displayed in Napoleon’s new museum in Paris, is just one example of this. In the imperial histories of new technologies of visualization, both the resistance and the murder of these people are nonexistent, while the depictions of Egypt’s looted treasures, which were rendered in almost photographic detail, establish a benchmark, indicating what photography came to improve. I’ll come back to this point in my fourth statement, when I’ll discuss the Great March of Return, the march against imperialism and the apparatuses that sought to render obsolete and bury the just claims of the marchers under the “statute of limitations,” negating their attempt to rewind the declaration of a “new” state in their homeland. My proposition, however, is that photography did not initiate a new world; yet, it was built upon and benefitted from imperial looting, divisions, and rights that were operative in the colonization of the world in which photography was assigned the role of documenting, recording, or contemplating what-is-already-there. In order to acknowledge that photography’s origins are in 1492, we have to unlearn the expertise and knowledge that call upon us to account for photography as having its own origins, histories, practices, or futures, and to explore it as part of the imperial world in which we, as scholars, photographers, or curators, operate. Let me briefly present an excerpt from the well-known and frequently quoted report by Dominique François Arago, which was delivered in 1839 before the Chambre des Deputes and is considered a foundational moment in the discourse of photography. The speech is often quoted as an early attempt to define and advocate the new practice and technology of photography. I rather propose to read it as a performance naturalizing pre-existing imperial premises, which had prepared the ground on which the “new” invention could emerge. Such reiterations do not testify to the nature of the “new” technology but to the way photography, like other technologies, was rooted in imperial formations of power and legitimization of the use of violence in the form of rights exercised over others. For both Arago and Benjamin, the existence of images and objects that were not meant to be part of an imperial depository of art history, contained physically and symbolically in works of art waiting to be reproduced, is not a question or a problem but a given assumption. Reproduction is understood in this context as a neutral procedure ready to be used by those who own the proper means for it, and regardless of the will of those from whom the objects have been expropriated. It is based on this assumption and this understanding of reproduction that photography could be perceived and discussed as a new technology of image production and reproduction. A lineage of previous practices had to be invented for photography to be conceived of as a novel addition, a technology that alters and improves — substantially and on different levels — the quality of the end product. In this means–end relationship, not only is photography construed as a means to an end but the end is also construed as a given, and the existence of objects as simply given to the gaze — of the camera, in this case — is thus assumed and confirmed. The context of Arago’s speech enables one to reconstruct the regime of rights and privileges that were involved in the advocacy of photography. That the world and others’ worlds are made to be exhibited is not a question for Arago, nor is it a question for everybody but rather for a certain audience addressed in his speech with a familiarizing “you,” an audience made up of white men like him, French statesmen and scientists. The acquisition of rights to dissect and study people’s worlds — of which the Napoleonic expedition mentioned above is a paradigmatic example — and render their fragments into pieces to be meticulously copied with sharpness and exactitude is not posed as a problem but is taken for granted. For that to happen, those who are harmed by the violence — facilitated, among other things by the new means of reproduction, which had been imposed and used systematically by Napoleon’s brigade of draftsmen during the expedition to Egypt — should be bracketed and left outside of these debates in which the fate of photography is discussed, while the right to operate it is directly and indirectly accorded to a certain class, at the expense of others. 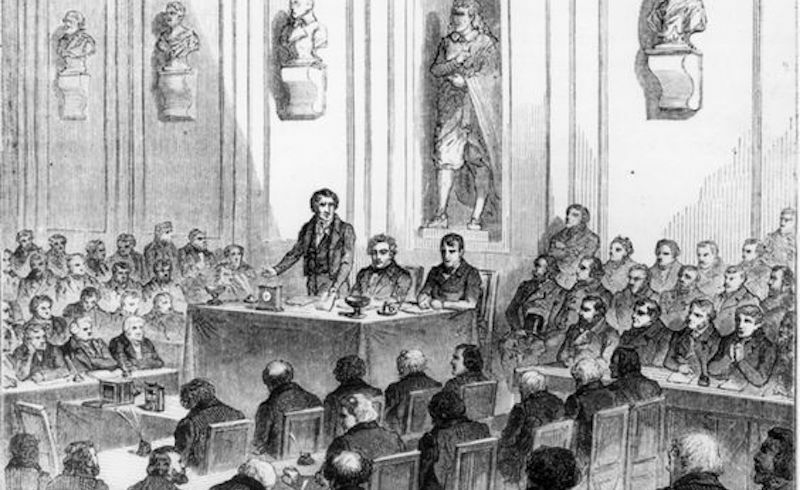 In 1839, those who were directly invoked by Arago’s “you” had already been responsible for large-scale disasters that included genocides, sociocides, and culturcides in North and West Africa and the Caribbean islands, for naturalizing and legalizing these acts through international institutions and laws, and for instituting their rights to continue dominating others’ worlds. At that point, the universal addressee implied by Arago’s “everybody” and “everyone” is fictitious not only because so many were not included but mainly because those who were intended as universal addressees could not come into being without dissecting, bracketing, and sanctioning the experience of violence as other than it was. The violence of forcing everything to be shown and exhibited to the gaze is erased and denied when the right in question is only the right to see. If the right NOT to exhibit everything had been respected — as it existed in different places the imperial agents invaded — a universal right to see that endows “everybody” with unlimited access to what is in the world could not be founded. Thus, extending the right to see so as to render “everybody” a truly universal is not possible without perpetrating further violence: that of denying that objects are not universal, they have different inherent functions and varying modes and degrees of visibility and accessibility within their communities. The forced universalization of objects was required for the invention of an allegedly universalized spectator; this was made possible only because those who care for their objects had them expropriated, along with the right to handle them as an inheritance from their ancestors and use them to continue to protect their worlds. Protecting one’s world against the invasion of the “new” is not a matter of extending imperial privileges to others but of questioning the imperial authority altogether to impose a universal right on heterogeneous worlds whose members maintain a different relation to the material world in which objects are organized not simply to be looked at. If the principle that not everything should be made available for everybody to see had been respected, the existence of a universal right to see would be a complete fraud. When photography emerged, it did not halt this process of plunder that made others and others’ worlds available to the few, but rather accelerated it and provided further opportunities and modalities for pursuing it. 1. Dominique François Arago, “Report,” in Classic Essays on Photography, ed. Alan Trachtenberg (New Haven, CT: Leete’s Island Books, 1980), 17; italics mine. 2. Walter Benjamin, Selected Writings, vol. 3, 1935–1938 (Cambridge, MA: The Belknap Press of Harvard University Press, 2002), 21; italics mine.